Precision Spatial Filter 10SF130 filters the beam from any low power visible to near infrared laser. The result is a delivering output beam with a smooth, near ideal intensity profile. The Spatial Filter consists of two YZ Positioners 5ZYP and Translation Stage 7T173-20SF (modified Translation Stage 7T173-20). YZ Positioners for Lens, Pinholes and Objectives 5ZYP provides adjustments of the pinhole and objective in two axes. 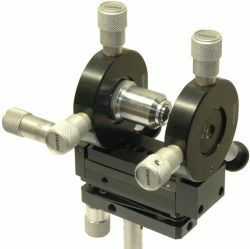 The precision X-axis motion is provided by Translation Stage 7T173-20SF. The pinhole and the objective should be selected and ordered separately. STANDA provides the selection of interchangeable microscope objective lenses and precision pinholes, allowing you to build the best spatial filter for your laser.